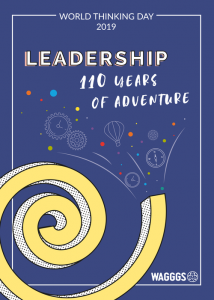 World Thinking Day 2019 – Leadership 100 years of adventure! In 2019 World Thinking Day is dedicated to the group of girls who took the lead in 1909 and demanded Lord Baden-Powell create ‘something for the girls’. By taking part you will be embarking on an adventure through time. You will learn about the history of our Movement, and practise leadership through the chances and choices of our present and future. Be prepared for an exciting adventure! The World Thinking Day activity pack – including how to earn your Thinking Day badge and information about the Thinking Day Fund – is available now and can be found on the WAGGGS website here or can be downloaded as a pdf here. Girl Guides Australia is keen to hear the stories and news on what activities our Girl Guides and units will be doing on the day – and lead up to this great Guiding day. Send your stories to us via our Facebook page and via our Twitter @girlguidesaust.